Home » Countries » gardens » History » Popular Articles » UK » Stonor: one family’s home for over 8 centuries! But for how much longer? 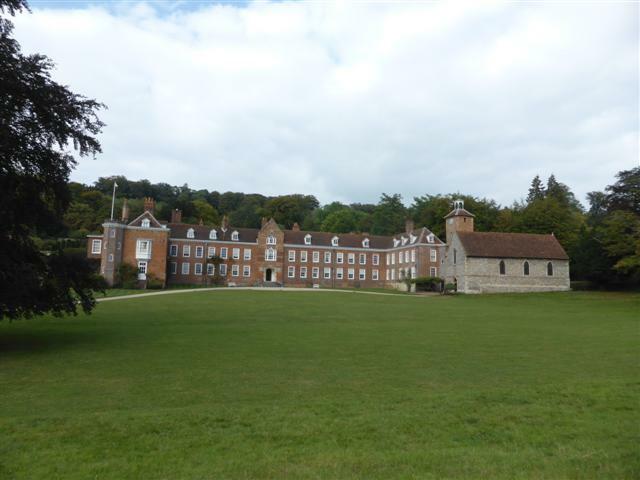 Stonor: one family’s home for over 8 centuries! But for how much longer? Henley, UK. Driving through the gates, we were surrounded by open parkland. A herd of deer looked up from nibbling the grass, and paused to stare at us, wondering whether we were a threat worth abandoning the lush green grass for! In the end, they half-heartedly trotted higher up the hill and watched us as we passed. Parking the car, we walked towards the Chapel. I was absolutely amazed to see a stone circle on the grass, with other stones scattered around it. It’s over 4,000 years old. The stones are sarsen, a hard sandstone which is the main type of stone used at Stonehenge. A lot of them probably ended up where they are now after travelling along, pushed by ancient glaciers. But the rest were dragged into place, and used for Pagan ceremonies. The Stonor family name comes from the stones, so their link with the land obviously pre-dates the house. It used to be De Stonor. The family crest is a hill with prominent stones. The first recorded Stonors were landowners in 1156. By the early 14th Century, they had become titled gentry thanks to Sir John de Stonore (1281-1356) who was a Justice of the Common Pleas, (whatever that was,) then Chief Justice and a member of Edward III’s Privy Council. A large stone in the corner of the Chapel was placed there as a symbol of Christianity, adapting a Pagan site, as ordered by Pope Gregory the Great. The chapel of the Holy Trinity was built in the 13th Century, and has always been Catholic, surviving 250 years of persecution after the Reformation. It has been solely for the use of the Stonor family. Behind the Chapel is the oldest part of the house, built in the 13th Century. The Chapel Tower was added on in 1416-17 by immigrants from Bruges who were bricklayers. What you now see is the family home. They still live there, and guests sleep in the bedrooms that are open to the public. Like a lot of English Aristocracy in the early 20th Century who were struggling to pay their bills, in 1911 the 5th Lord Camoys married Mildred Sherman, an American heiress, from Rhode Island. She also rescued her son from financial ruin. But he still had to sell 2,000 acres of land, plus timber, building plots and farmhouses to save the Estate. Their portraits are on display, plus some American furniture. Also in the room was a small stool, which I was told was a Victorian gout stool, to rest the sufferer’s leg on. Apparently they used to be quite common. The Francis Stonor Bedroom contains a shell bed, and shell-lined chairs, which were designed for a shell-lined grotto. I loved them, but I’m not sure if I’d like them in my dining-room! Running through the width of the house and dating back to the 14th Century, the Library was altered in the 16th Century. The bookcases were added in the 19th Century. It’s an interesting room because, as the house is built into the side of a hill, at one end of the room is a window, three stories up from the garden, and at the other end are French windows that open directly onto the gardens! Elisabeth, Lady Camoys was waiting at the top of the stairs to greet us. She is very much involved in the running of the house. Her husband, Thomas, Lord Camoys, joined us. They both explained that as Stonor is not a Charity, they have to pay VAT on all their bills, so everything works out more expensive. The National Trust doesn’t want Stonor. They already own enough properties which need looking after all the time. Shortly, Lord and Lady Camoys will be moving into a smaller house on the estate and their son and his family will be taking over the running of Stonor. I asked them if they’ll miss living in a lovely house like this, but they both seemed to be looking forward to their retirement and having the burden lifted from their shoulders! Their son and his wife are already deeply involved in the running of the Estate. Stonor is unique as it has always been passed down directly through the male line. And Lord Camoys assured me that there had been no cheating! Sadly, a lot of the British people have an inbuilt streak of jealousy. They begrudge someone having something which is bigger or better than theirs. And they might find it hard to care about Stonor. Like a lot of us, whether we own a small apartment or a large detached house, the Stonor family has spent a lifetime worrying about how they’re going to cope with paying their bills. The Government is talking about bringing in a Mansion Tax. If they do, many old houses like Stonor will vanish for ever. It mustn’t happen. Soon this country won’t have any historical properties left. The sites will all be redeveloped into ugly housing estates, or industrial warehouses, many of which will be empty and To Let as people can’t afford the rents! All the money from their sales will have been wasted in bombs and missiles, and destroying the rest of the world. Do they care at all about preserving our heritage, or are they just interested in grabbing loads of money for themselves, and causing misery and destruction to everything they touch? I travel a lot as you know, Dear Readers. I get taken to a great variation of museums, mansions, monasteries and memorials, all over the world. But Stonor stands out for me. I’ve seen prettier, and a lot grander places. But Stonor won my heart. I can’t forget it. So what makes Stonor so special for me? It’s the fact that it’s a family home, and has been for over 850 years. It has a warm, friendly atmosphere, plus a lot of love. Through the Centuries, it’s withstood wars, bills, and religious persecution, and won – with difficulty! And they’re still there, surviving; just! What right has a temporary, just-passing-through.Political Party got to ruthlessly and greedily grab an Olde English piece of history before getting kicked out of power for their incompetence? Yes, we’ll vote in another lot of bodgers who’ve promised us the world. But it will be Goodbye to Stonor. Something must be done, before it’s too late!